Nothing is more fun than a good game of tug with your pooch. Unfortunately, tug has gotten a bad reputation; many pet owners believe that tug teaches their dogs to “be dominant” or to “be the boss.” Not to worry — it doesn't. In fact, tug is an excellent way to bond with your dog and to direct his excess energy into a healthy outlet. Tugging on the end of a toy comes naturally for most dogs; when dogs play, they often rehearse behaviors they would use for survival. Playing tug mimics the natural predation sequence of pulling an animal down and ripping away pieces of the meat to eat. Although most dogs are not capable of actually taking down a wild animal, they still have the genetic programming to do this part of the predatory sequence, which makes tug an excellent tool for mental stimulation and exercise. In addition, tug can be used as a reward for a job well done; many working dogs, including canines for the National Disaster Search Dog Foundation, are motivated during training by the promise of a good game of tug. Be aware that some dogs will growl when they play tug. In the majority of cases, this growling is a normal part of dog play. However, if your dog has a history of guarding objects or food, or if he shows tense body language, check with a behaviorist or certified professional dog trainer to be sure that tug is a safe game to play with him. When tug is played with appropriate rules, it can be used as a powerful reward for displaying good behavior, which helps create more structure in the human-dog relationship. Here are three simple steps to a safe game of tug. Teach “take it.” Give your dog a specific cue that lets him know he can take the object into his mouth. This helps prevent your dog from putting his mouth on any object to engage in a game of tug and lets you initiate the game of tug. Only use specific toys for tug. 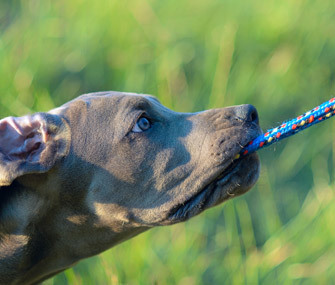 Some dogs will try to play tug with any object, such as a child’s stuffed animal, but if your pooch is taught that tug only occurs when the command “take it” is given and only with a specific toy, tugging on off-limits objects becomes less of a problem. I like using rope toys, such as a pet dental rope, which has the added benefit of cleaning teeth while your dog plays. Teach “drop it.” In order to keep the game of tug under control, teach your dog to let go of the tug toy on command. Unfortunately, tug can get out of hand when owners are trying to pry a dog's teeth off an object to get him to let go. By teaching “drop it,” you are actually teaching your dog self-control; only after he releases the toy can the game continue. In other words, you are teaching him that in order to get what he wants, which is to continue tugging, he needs to drop the toy first. In some cases, you may need to teach “drop it” with a less valuable toy first, such as a tennis ball, before you work on teaching it with the more exciting tug toy. Teach no teeth on skin. Your canine needs to learn to be extremely careful about where he places his teeth. As soon as teeth touch your skin, mark it with an “oops” or “ouch” and immediately drop the toy. Wait 15 to 30 seconds before you begin the game of tug again. The no-teeth-on-skin rule helps keep you safe and teaches your dog to be careful with how he uses his teeth.